Austin, TX – March 2019 – In an effort to continue its quest towards innovation, popular restaurant and business management solutions provider SalesVu has partnered with Square, a leading payment processing service and provider of POS(Point of Sale) solutions. With a wide variety of free SalesVu applications currently available, the partnership will allow SalesVu’s free applications to integrate with Square’s payment hardware for increased capabilities and enhanced user experience. OrderUp – An app that allows customers to self-order that automatically sends orders to the Square Register. Incoming – Automatically displays all orders from Square Register in the Kitchen. Customer Display – Displays orders from Square Register to customers so they can add a tip and sign discreetly. Restaurant-Branded Smartphone Ordering App – All orders placed on this app automatically appear on the Square Register with pickup or delivery information. Restaurant Website – All orders placed on the restaurant website will automatically appear on the Square Register with pickup or delivery information. Optional apps that can be integrated with Square include free OnTheList, which handles reservation waitlist with SMS notifications; free OrderUp for self-order kiosks; as well as a number of other solutions which handle everything from gift cards and loyalty rewards to invoicing and order management. Square is a popular payment processing solution that has already been implemented by many businesses. Under the new partnership, any business with an existing Square account will be able to download the free SalesVu apps and be running in no time. For additional information, please visit the SalesVu website. Founded in 2007 in Austin, TX, SalesVu is a leading provider of restaurant management solutions that include a robust portfolio of iPad apps, as well as cloud-based remote management features. A point of sale (POS) system can do everything a cash register can, plus so much more that will help you run your business better. If you operate a farm-to-table restaurant, you may have chosen to use a traditional cash register for your payment management system. Cash registers can be an appealing choice for small businesses because they’re fairly inexpensive and durable. However, a POS system, especially one that runs on a mobile device such as an iPad, can do everything a cash register can, plus so much more that will help you run your business better. 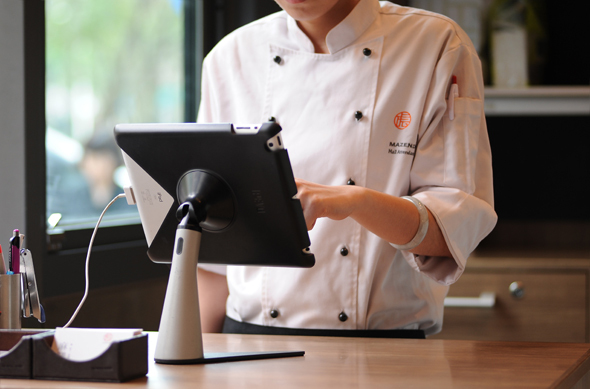 Here are four advantages an iPad POS system can offer your restaurant. An iPad POS system can provide a great deal more information about all aspects of your business than a traditional cash register. One particularly vital aspect is inventory management. Your farm-to-table restaurant likely deals with smaller, independent suppliers, so finding the right balance for your orders is key. Order too little, and you risk turning away disappointed customers when you run out of a favorite dish. Order too much, and your unused fresh produce spoils on the shelves, creating costly waste. An iPad POS system can keep track of your inventory and tell you when and how much to reorder, based on sales and usage. It saves you the labor of manual inventory, eliminates ordering guesswork, and minimizes potential lost revenue. Another managerial headache that an iPad POS system can alleviate is employee scheduling. Your POS can chart your busiest and off-peak times of the day, week, month, or season, helping to ensure that you aren’t understaffed (creating unfavorable customer experiences) or overstaffed (paying unnecessary labor costs). You can also evaluate each employee’s sales performance, so you can schedule your best workers where you need them most. And you can keep an eye out for employee theft, as the system tracks who is responsible for all transactions, including voids and refunds. Your farm-to-table restaurant needs to gain and keep customers. An iPad POS system will maintain a wealth of information about your customers — including contact information and purchase histories — which you can use to create targeted marketing campaigns. You can also set up a loyalty rewards program to encourage return visits and increased spending. And you can offer gift cards and discount coupons, all managed with your POS. Another way that an iPad POS system offers greater functionality than a cash register is in how it integrates with other business tools. Many POS systems can share sales data with programs such as QuickBooks or other accounting software, saving you time and labor. If you’ve already discovered the benefits of a kitchen display system, your POS can coordinate all incoming orders for the KDS, not just in-house but also online orders from your website or app, or to-go orders placed on a self-service kiosk. You can also accept a wider variety of payment methods, as the POS can be equipped with readers for EMV chip cards or mobile wallet payments such as Apple Pay or Google Pay. And if you’re buying (or selling) items in bulk, you’ll want a POS that can integrate with an NTEP Certified scale. SalesVu offers a variety of free apps that can turn any iPad into a POS system. Your farm-to-table restaurant will gain not only payment processing functionality but also reservation and table management (OnTheList); loyalty programs, gift cards, and group discounts (Regulars and VIPz); staff scheduling (Shift); kitchen display system coordination (Incoming); and more. No cash register can do all that. Plus, with SalesVu you’ll have 24/7 customer support. Contact SalesVu to explore the benefits of upgrading your restaurant cash register to an iPad POS system. Posted in Restaurants and Bars	| Tagged Restaurant POS, Support	| Comments Off on A point of sale (POS) system can do everything a cash register can, plus so much more that will help you run your business better. Traditional cash registers might seem like the best payment management option for small business owners, including farmers. A cash register is relatively cheap and has a long lifespan. But an iPad-based POS system offers a whole new realm of opportunities to improve your business and to add functionalities that no cash register can provide. Let’s look at some of the advantages of POS for farmers. An iPad POS system will improve the overall efficiency of your business by providing access to a wide range of data that gives insight into your sales, customer behavior, employee performance, and more. Create more detailed sales and accounting reports than you can with a cash register, and even feed that information directly into your accounting software. Another key functionality for greater efficiency is inventory management. Automatically track inventory based on sales and usage, reducing the labor and potential human error of manual inventory. You’ll get alerts when it’s time to restock, and you’ll know how much to replenish, avoiding waste from overstocking. A POS for farmers who sell items in bulk can be integrated with an NTEP Certified scale for tracking inventory by weight. With an iPad POS for farmers, you can accept a greater variety of payment methods than simply cash or check. A 2017 survey by payment processor TSYS revealed that 44% of consumers prefer to pay by debit card, and 33% by credit card. Your POS can be equipped with card readers so you can accept these payments, including payments by EMV chip cards. You can also accept mobile or digital wallet payments from sources such as Apple Pay or Google Pay. According to the 2017 American Express Digital Payments Survey, 46% of respondents said they rarely or never use cash anymore; so you should be prepared to handle the types of payments your customers prefer. You’ll also be able to give your customers more detailed receipts than those provided by a cash register, with information such as item descriptions, prices, and coupons or other discount savings. Another advantage of an iPad POS system over a traditional cash register? Mobility. It’s easy to take your POS anywhere there’s an internet connection, whether you’re selling at the farmers’ market or participating in local festivals or tasting events. Take payments in house or on the road. A POS for farmers can help you provide a more positive customer experience. Not only can you take all types of payment and give better receipts, but the checkout process will be faster and more efficient. An iPad-based system will have an intuitive interface, one that your employees will likely already be familiar with from their own personal devices, so it will be easy for them to learn and use. And using a barcode scanner to ring up products is much faster (and more accurate) than manually keying in item numbers and prices on a register. With an iPad POS, you can utilize consumer data to create targeted marketing campaigns and implement programs designed to retain customers, such as a loyalty rewards program. These programs create a sense of connection that customers desire, and they increase satisfaction. Buyers will be encouraged to return more often, and they tend to spend more when a loyalty program is in place. You can turn any iPad into a POS system by using the free apps offered by SalesVu. You’ll find the tools you need to run your business better, from payment processing to loyalty programs. For more detailed analytics, you can subscribe to SalesVu’s cloud services. And you’ll have access to customer support, 24/7. Contact SalesVu today to learn more about the benefits of POS for farmers. Austin, Texas –April 3, 2019 – Continually striving to innovate and improve its software, iPad POS software provider SalesVu has recently announced its new integration capabilities with Tessitura Network. Tessitura is a unified enterprise system for arts, cultural, and attraction organizations that powers key business functions including ticketing and admissions, fundraising, memberships, education, marketing, analytics, and more. .
With this new integration, museums, attractions, and performing arts organizations using the Tessitura system can look up any customer in their database using the SalesVu POS System. Customers can be searched using membership number, name, phone, email, or customer membership card. Customer discounts, coupons, and loyalty rewards points can then be directly applied to any purchases. All existing Tessitura gift certificates can be redeemed with the SalesVu POS app by scanning the card or manually entering the certificate. Purchase history from SalesVu is transmitted to the Tessitura CRM providing organizations with a full view of all purchases and interactions in keeping with their 360 degree approach. SalesVu offers a number of free iPad POS apps and auxiliary solutions, which can be utilized for bars, gift shops, and concessions stands in entertainment venues and arts and cultural organizations. This integration achieves great strides in the ongoing quest for better overall customer experiences in arts and cultural organizations and enables them to have a unified system. By integrating the Tessitura system with free SalesVu POS apps, organizations can drastically reduce the time it takes to look up customer information, apply discounts, and process transactions. Tessitura is an enterprise CRM system that powers all key business functions for museums, attractions, and performing arts organizations. From ticketing and admissions, fundraising, and memberships to marketing, education, analytics, and more, Tessitura’s unified platform enables a seamless, 360-degree view of all visitors, donors, members, subscribers and volunteers. In addition to its flagship software, Tessitura offers a range of complementary services that empower its users to achieve their goals. Those users form a community of industry leaders that enjoys an unprecedented level of knowledge sharing and collaboration. Tessitura also works with a wide range of ecosystem partners that provide products and services to extend the power of what its members can do. Operating since 2001, Tessitura Network, Inc. is proud to be a member-owned and governed nonprofit. Tessitura serves over 600 organizations in ten countries including museums, theatres, performing arts centers, operas, orchestras, festivals, dance companies, zoos, aquariums, film centers, historical sites, and more. For more information about Tessitura, visit www.tessituranetwork.com or contact Laura Bowden, Vice President of Administration, at media@tessituranetwork.com. For partnership inquiries, contact Strategic Alliance Manager Kelly Degenhart at kdegenhart@tessituranetwork.com. If you operate an entertainment venue or manage an arts and culture organization, chances are you’re already familiar with Tessitura, the widely-used, industry-specific customer relationship management (CRM) platform. But if your point of sale (POS) solution isn’t integrated with your CRM program, you’re missing valuable benefits. Here’s why CRM integration is a must-have when you’re choosing a POS solution. View customer purchase history in one place. When your CRM and POS System are working together, all of your customer information is available in a single, consolidated database rather than two separate ones that require extra work to coordinate. The unification saves you time by eliminating the need to manually enter data from one source into the other, and it provides several benefits. Staff members can access a customer’s purchase history during a transaction to assist with upselling, check for deals, or see if organization membership needs to be renewed. Ticket sellers and front of house staff will be able to identify significant donors and other VIP customers and acknowledge them accordingly. The shared information can also be used to create specifically targeted marketing campaigns and personalized communications — ensuring that customers see offers that are most relevant to them, which increases their overall satisfaction and fosters loyalty and repeat business. Find customers in your CRM database. CRM integration with your POS solution makes it easy to look up customers from your database. You should be able to search using any of several pieces of data, including customer name, phone number, e-mail address, or membership number. Or, for even faster service, simply scan the customer’s membership card. Recognizing your customers and offering personalized service goes a long way toward strengthening the relationship and encouraging continued patronage. And upselling suggestions based on purchase history are a great way to increase ticket size and revenue. Once you’ve looked up customers in your CRM database, you can easily (even automatically) apply any appropriate membership discounts or loyalty program reward points toward purchases in concessions or gift shops. And if membership needs to be renewed, it can easily be done as part of the transaction, thereby maintaining both the customer relationship and the stream of revenue from memberships. Both are particularly important to arts and culture organizations. Customers can purchase gift certificates and gift cards through the Tessitura platform. CRM integration with the free POS solutions available from SalesVu (including OrderUp self-service kiosks) enables easy redemption of Tessitura gift certificates. To use a certificate, simply scan it at checkout or enter the number manually. Customers appreciate the convenience, increasing their satisfaction and loyalty. ‘Our initial attraction to SalesVu was its mobility and scalability. As a major presenting arts organization, we have an ever-changing range of needs across our venues, events and festivals and we were searching for one system that would allow us to capture both concessions and merchandise sales with an easy to learn interface for part-time/seasonal employees. The Tessitura integration will give us the ability to see a more complete picture of patrons’ spending with us and more easily fulfill membership perks. Being able to process Tessitura gift certificates will allow a gift certificate to be used for anything in our venues, not just tickets’. SalesVu currently offers the only integrated POS solution that accepts Tessitura gift certificates and cards. To find out more about the advantages of integrating SalesVu POS and Tessitura, contact SalesVu today. Over the last few years, self-order kiosks have shown a steady upswing in popularity at all types of restaurants, from fast-casual to full table service. But other industries can benefit from the advantages as well. In particular, theaters, playhouses and other entertainment venues can increase customer satisfaction and improve bottom lines by adopting self-service. Here’s why. Theaters need to keep people moving through both ticketing and concessions lines, so people can make it to their seats before the show begins. If it looks like there will be a long wait to get their refreshments, they may well decide to skip it — and since the majority of a cinema’s profits comes not from ticket sales but from concessions, you can’t afford that scenario. Similarly, arts and cultural performances — from ballets and operas to plays and stand-up comedy shows — have only brief intermission periods for patrons to take restroom breaks and purchase food and drink. Self-order kiosks keep the lines moving so you can serve as many patrons as possible during those breaks, and they won’t miss any of the performance. Orders can be placed and paid for more quickly, and staff members can focus on efficient fulfillment rather than order placement. Self-order kiosks increase speed of service because employees are concentrating on order preparation instead of having to input the order and process the payment first. Cinemas can even combine ticket and concessions sales into a single transaction to save even more time. And self-service is also more accurate, since customers are entering their own specifications (so there’s no miscommunication, especially in a crowded, noisy lobby), and they can verify their orders before sending. Avoiding mix-ups reduces food waste and increases customer satisfaction — so they’re more likely to repeat the experience. Perhaps the biggest way for self-order kiosks to provide a healthy return on investment is by increasing concessions revenue. Self-service encourages customers to order more food and drink with automatic upselling suggestions (“Would you like to make it a combo?”) and enticing visual images. Impulse buying and add-ons increase, thereby raising overall order sizes — and profits. The Washington Post reported in 2015 that at Cinemark movie theaters, self-service kiosks had helped per-person concession spending to increase for 32 straight quarters. OrderUp is a SalesVu POS System that turns an iPad into a self-order kiosk. You can create a free account and download the app today to start enjoying the benefits of self-service. Contact SalesVu to get started or to reach their 24/7 customer support with any questions about how to put these advantages to work for you. Coffee-shop operators have a lot on their plates. They’re serving a high volume of frequently complicated and specialized drink orders in a fast-paced environment, doing everything they can to provide exceptional customer service in a competitive niche — and also trying to operate in the black. Having the right POS system can make achieving those objectives easier. Here are four of the best free POS apps that enhance functionality for coffee shops. If you have a kitchen display system (KDS) — and you probably should since it has many advantages over paper ticket systems — then one of the best free POS apps to consider is Incoming. This app allows you to view and manage orders placed from any source. Going paperless not only reduces cost (and waste) of ink and paper, but also improves order accuracy. It also streamlines prep times by sending the order elements to the appropriate stations, such as the espresso machine or the pastry counter, for speedier fulfillment. OrderUp is a free POS app that turns an iPad into a self-service kiosk — which has many benefits, especially for businesses like coffee shops where the orders are highly customizable and specific. With self-ordering, customers place all of their requests directly into the system, which greatly reduces the chance that some element will be overlooked or miscommunicated. That venti, low-fat, half-caf, triple-shot, iced caramel macchiato needs to be served just as ordered to ensure customer satisfaction. Plus, patrons placing their own orders tend to include more add-ons and extra items, increasing overall ticket sizes. And self-service kiosks can bust lines at the counter, so busy morning rush-hour commuters can get those caffeine fixes quickly and get to work. For group-based discounts and special deals, one of the best free POS apps is VIPz, similar to Groupon — but it won’t cost half of your profits. You can use VIPz to introduce your coffee shop to new customers and bring in new business. This app also lets you create offers that are valid during slower periods of the day/week/month, to help maintain a steadier flow of revenue. Coffee shops have a particularly high potential for earning repeat business, as commuters make your stop a part of their regular morning routine. Another incentive that will increase this likelihood (besides quality products and great service) is a loyalty rewards program. Regulars is one of the best free POS apps that help you set up and manage a rewards program based on purchase amounts. It’s easy to track balances and redeem rewards. Loyalty programs forge a personal bond with your customers and make them feel that you value their business — which makes them want to keep coming back. In addition to providing these free POS apps, SalesVu can help you create a brand-specific app and modern-looking online ordering website so your customers can place orders on their smartphones and computers. This provides greater convenience for your customers, and increased revenue for you. You may not be a giant franchise like Starbuck’s, but you can look just as professional and tech savvy as your big competitors. These best, free POS apps are available from a single provider, one that offers round-the-clock customer support every day. SalesVu’s apps all integrate with Square Register and other POS systems to provide the add-on functionalities that coffee shops need most. To find out more, request a demo, or set up a free account, contact SalesVu today. Austin, Texas – December 11, 2018 – SalesVu, a leading provider of restaurant management software applications for iOS devices offers solutions to help SMBs save money during the holiday rush. Restaurants everywhere are spending additional dollars to handle the chaotic holiday season. Whether restaurant operators are investing in additional seasonal employees or new hardware and software, the end result is the same; higher costs. SalesVu offers restaurant management applications for FREE to restaurants that need to streamline operations during the holidays. SalesVu offers every single one of these solutions as an individual free app. And, because SalesVu does all of the data entry for the customer, these apps can be configured in minutes. Cloud-based versions for multi-unit chains are available for a small month to month subscription and additional iPad terminals can be added for a low one-time cost. In addition to offering free restaurant management apps, SalesVu has partnered with credit card processing companies to offer no-fee credit card processing during the holidays and into the New Year. This means that the first $10,000 processed, through free SalesVu apps and with participating credit card processing partners, will not incur any credit card processing fees. As long as the first transaction is processed by December 31st, credit card processing fees will be waived for up to $10,000 or for six months, whichever happens first. Reach out to SalesVu now to take advantage of this opportunity before the end of the year. Founded in 2007 in Austin, TX, SalesVu is a leading provider of restaurant management solutions that include a robust portfolio of iPad apps as well as cloud-based remote management features. The evolution and increased availability of technology has led to high consumer expectations of convenience and personalization in their dining experiences. Self-service kiosks, which have risen steadily in popularity in recent years, are a prime example of how to meet those standards. Self-service isn’t just for fast-food places or QSRs; full-service restaurants can benefit from it as well. Here’s how. Full-service restaurants can use self-service kiosks to streamline the processing of to-go meals. Orders are transmitted directly from the customer to the kitchen, eliminating the need for a front-of-house middleman. Those staff members can be reallocated to focus on dine-in customers or to help the kitchen prepare the to-go orders faster, providing a better experience for all customers. 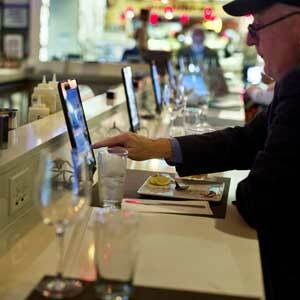 Full-service restaurants can also place self-service iPads at each table so that guests can start ordering drinks and appetizers without having to wait for the availability of their server. This streamlining not only gives servers more time to provide personalized attention but also speeds up table turnover, thereby increasing revenue. Restaurant self-service kiosks greatly improve order accuracy, so your staff won’t be wasting time and food on rejected orders. The kitchen gets the order information straight from the customer, virtually eliminating potential server miscommunication or misread tickets. With the visual prompts, customers can see images of exactly what they’re ordering and have the opportunity to review and check their orders before submitting. They can customize the entire meal to their specifications, increasing overall satisfaction with their experience. While restaurant self-service kiosks are especially popular with millennials, who appreciate and are accustomed to the convenience afforded by technology, older generations can find reasons to appreciate the experience as well. Streamlined ordering expedites the food preparation process, so diners get their food faster. And they can have greater confidence that they’re getting exactly what they wanted, since they customized their own choices based on clear visual imagery. Finally, the social aspect of dining out is actually improved, because when servers don’t have to be running orders back and forth from the kitchen, they have more time to interact with their guests (which can lead to better tips for them as well). One of the biggest benefits of self-service kiosks for full-service restaurants is the increase in revenue. As more restaurants and franchises adopt self-service, results consistently show that when customers place their own orders, ticket sizes increase. According to an article in the Harvard Business Review, when Taco Bell introduced its digital app in 2015, orders placed through it averaged 20% higher than orders placed with human cashiers. In 2014, The Atlantic reported that when Chili’s introduced tabletop tablets, dessert orders rose 20% (perhaps, as the article suggests, because diners don’t feel they are potentially being judged by the server for what they’re ordering). And in 2018, Australian chain Hog’s Express claimed their average spend per person rose a whopping 30-37% with self-service kiosks. What drives these increases? For one thing, the graphical interface of a self-service kiosk provides appealing images of the food to whet diners’ appetites. Customers can also access lists of specials or other items they might miss on a regular menu or the specials board they pass by on their way in. Finally, guests placing their own orders tend to select additional ingredients or extra add-ons when prompted by the upselling features built into the self-service software. Restaurants no longer have to rely on their employees remembering to upsell consistently, because it’s automatic — and it works. Those extra toppings, sides, drinks, and combos add up. The new normal for consumers can be summed up in two words: convenience and automation. Consumers can hail a ride in self-driving cars through Lyft or Uber, they can go to cashierless stores, such as Amazon Go, and even have drones deliver packages right to their doorstep. Sooner or later, they will begin to expect the same convenience and automation in their dining experiences. We are not far off from having serverless restaurants where diners view the menu, place their own orders and pay their bill all via a device on the table. Quite a few restaurants across the United States are already testing this new experience or implementing a hybrid method that employs waitstaff who are ready on the sidelines and available upon request. Don’t fall behind. Stay a step ahead of your competition by offering menus on iPad devices at your tables, rather than old-fashioned printed paper menus, in order to provide more information to your diners about the ingredients in each meal and the history of each dish. The menu should be an integral part of the dining experience. After your customers begin to get accustomed to reviewing your menu via iPad, begin to add “order” buttons next to each dish to streamline the ordering process by sending your customers’ orders immediately to the kitchen. For all of these reasons, restaurant self-service kiosks provide a healthy return on investment. Discover how SalesVu can help you quickly and easily implement a self-service solution. Download the OrderUp App for iPad now, or contact SalesVu to learn more.